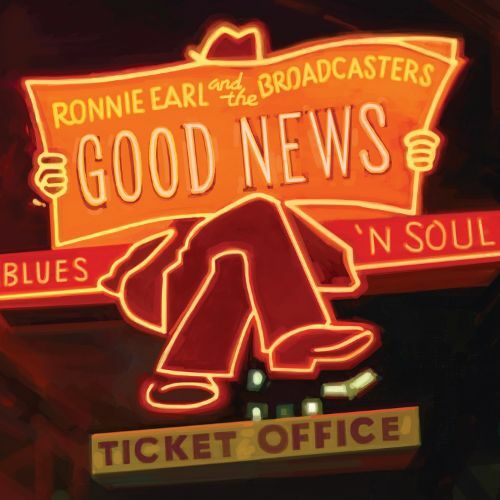 On Good News, Ronnie Earl & The Broadcasters pay tribute to Sam Cooke’s seminal 1964 album ‘Ain’t That Good News’ with a set that runs the gamut from caressing to ferocious. Earl builds on his reputation as a virtuosic blues player while delving into gospel, R&B, and rockabilly, honoring Cooke’s legacy of soulful idealism in the process. Joined by guest guitarists Nicholas Tabarias and Zach Zunis as well as singer Diane Blue, The Broadcasters display both grit and refinement in these tracks. “I Met Her on That Train” launches the album in fine style with a rollicking reworking of Junior Parker’s “Mystery Train.” Earl matches Blue’s tender vocal on Cooke’s “A Change Is Gonna Come” with luminous guitar lines, augmented by Dave Lumina’s vivid keyboards. Dreamy extended pieces like “In the Wee Hours” and “Blues for Henry” give the band plenty of elbow room instrumentally, while the gospelized title track and the blues-drenched “Puddin’ Pie” inject some swagger into the proceedings. The closing track, “Running in Peace”—a salute to the victims of the Boston Marathon bombing—circles back to the album’s central themes of hope, healing, and transcendence.